If expensive handsets were holding you back from jumping on the 4G bandwagon, Verizon has a treat for you. The carrier is introducing the Pantech Breakout Android 2.3 smartphone running on its 4G network, a device that will cost you only $100 with a two-year contract. The Pantech Breakout is a significantly less expensive option for those who want 4G speeds from their phones without having to pay a premium for it. The Breakout will cost $100 with a two-year contract, after a $50 mail-in rebate -- which even before the rebate, is half the price of the 4G Motorola Droid Bionic, retailing at $300 with a two-year Verizon contract. The Breakout debuts Thursday. As with most 4G smartphones, the monthly bill starts at $70, as Verizon says Breakout customers will need to subscribe to a $40 per month talk plan and a data package with 2GB of access bundled for $30 per month. Verizon has also preinstalled an 8GB memory card on the phone for your basic media storage needs. Verizon’s budget 4G Android handset packs some good specs, but as the price indicates, it’s not exactly a match to the Droid Bionic. 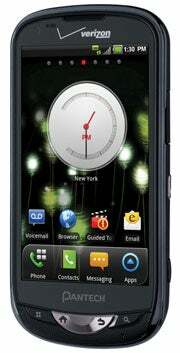 The Breakout (note it lacks Verizon’s Droid branding) runs on a 1GHz processor, has a 4-inch display (resolution 480 by 800 pixels), and dual cameras – 5 megapixels on the back and VGA on the front for video calls. In comparison, the Bionic has a dual-core 1GHz processor, a bigger and higher-resolution screen, as well as an 8-megapixel camera. For its price though, the Pantech Breakout on Verizon is not short on features. Verizon says users can expect 4G LTE download speeds of up 2 to 5Mbps in good coverage areas, and the phone can act as a connectivity hotspot for up to 10 Wi-Fi enabled devices (just keep an eye on those data caps). The Breakout is also DLNA-enabled, so you can play media from your phone straight to compatible devices, such as TV sets. Verizon sells other 4G handsets as well, such as the Droid Charge from Samsung for $300, the ThunderBolt from HTC for $250, and the LG Revolution for $200, all with a two-year contract.